Disclosure: I received the products below and compensation in order to review in exchange for sharing my honest opinion. 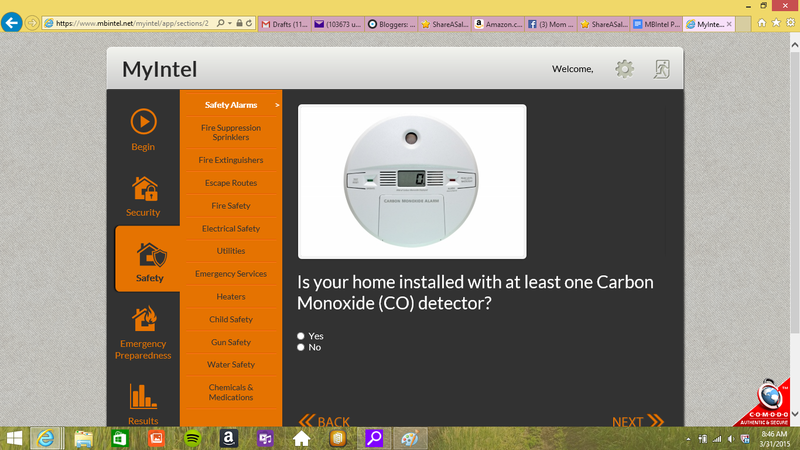 How safe are you in your own home? If you are like me you probably feel safe and snug like a bug in a rug. That's how I felt until I took the MB Intel Home Assessment. It was an enlightening experience for me. My life consists of raising my three babies Christian age 6, Gavin age 4 and Sierra age 4 Months and feeling safe and protected since my husband Chris Bailey is currently not working and home with me. It really is such a false sense of security though and I had no idea what dangers my family would face. I love the secure feeling of having Chris home with me and he is very experienced in safety and self defense than most. He has taken many gun training seminars and self defense classes and he has his Concealed Weapons Permit. He fought in many cage fighting battles and was very successful in the sport but quit when we became serious and started a family. He is also 6 foot 5 inches tall, has red hair and a temper to match and weighs 350 pounds all muscle! Yes ladies he's built! Even with all that he has done to be able to make us safer it can't prevent a natural disaster. It was 3:45 AM when it hit we were all in bed and that's when we saw the water was in the house. How on Earth do you get 3 kids safely out without freaking them out and scarring them for life. That was my first thought. First we assessed the situation, we could easily make our way to the car but it was very dangerous on either side the water could have risen at any time but it was a chance we had to take. I waited at the top of the hill where the water couldn't get with the car and Chris brought each child out to me. The last was our littlest Sierra it was such a frightening experience. Our house had never flooded before and we were not in the flood plane so it was something that no one could have expected or planned for. We were just glad to get ourselves and our kids out safely! My house and my possessions were pretty much all gone. We had time to bring out a few outfits for the kids, baby books, and our personal papers box. What I never expected was it is not the water a flood leaves behind that does the ruining; it is the sand and mud and sludge that settles on everything that ruins stuff. Two things I learned safe is never safe enough and family is all that matters. Hold on to the ones you love! 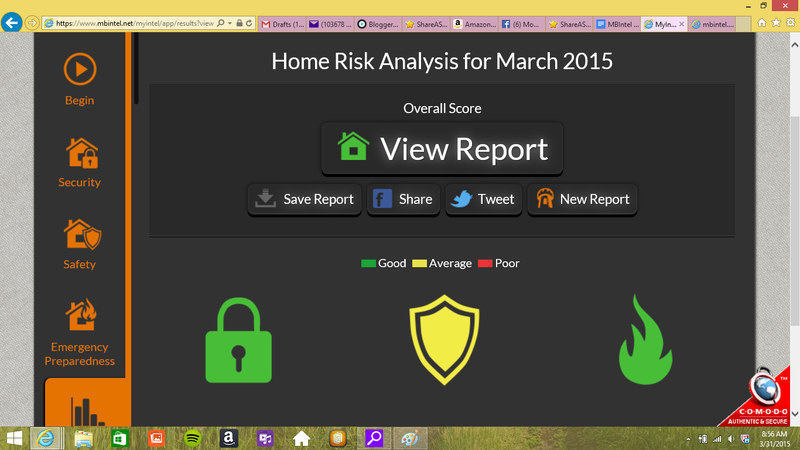 I was so excited to get my free risk analysis I tried the free first and let me tell you MB Intel points out so much you would never think of. If you think the free version helps with safety issues try the paid version. For only $29.95 you get a much more detailed and in depth analysis for every threat you could possibly think of. You can start here at MB Intel and find out how safe you are now. These are the results of my free trial you will have to buy the paid one to find out what great features it offers. 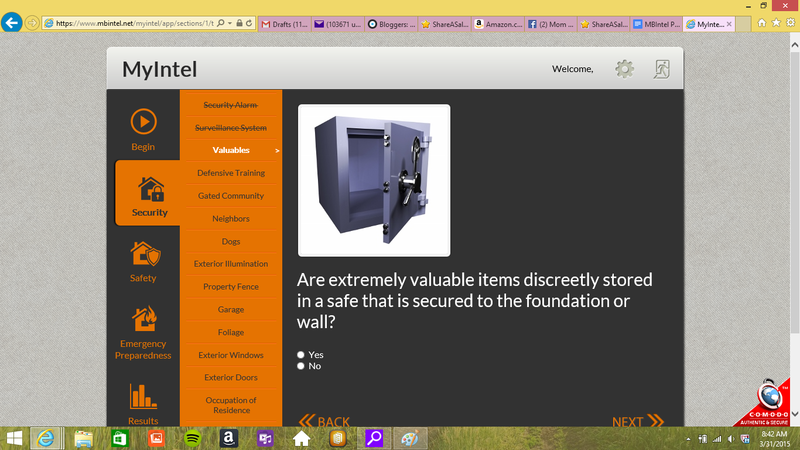 I can tell you it is much more in depth and I found 9 different areas that needed fixed to be safer in my home. Out of those 9 fixes 6 took less that 5 minutes. I think 5 minutes to be safer is well worth it. That 5 minutes just might save your life. Red means you have many safety concerns, yellow means you are in the mid range for concern and green means you are at low risk. I only had one area in the yellow and I kind of expected it. My safety was our lowest area and our highest was our preparedness for an emergency. After the flood I have been trying hard to get very prepared in case of an emergency so I am never caught off guard again. It is a helpless feeling don't be left in a bad situation. THEN TRY THE PAID VERSION!